True. It's probably better out way back then, but synthesized, than to come out maybe next year with all their lovingly fully customized, hand placed transistors. That's if they don't go bankrupt first. A large margin of error means that you have a lot of space to make errors with little consequence. I was dying for information like this. Thank you! 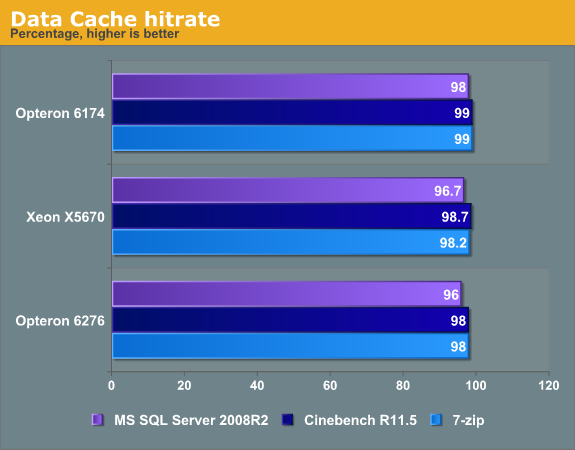 1) Maybe i missed something but, Should "Higher is better" be for "Data Cache hitrate", i.e. opposite to cache misses? There are a few new instructions in Bulldozer's architecture that, for certain specific computations, can make it 10X faster than Intel. For example, FMA. An FMA does a multiply and then an add as one instruction, rounding only once. Combining the multiply and the add isn't such a big deal (and in many cases can even be counter-productive), but rounding only once is very important in some cases. For example, assume you have 3 digits of accuracy and want to calculate (1.23 * 2.31 - 2.84). Without FMA, you calculate Round(1.23 * 2.31) = 2.84, then you calculate Round(2.84 - 2.84) = 0. With FMA, you calculate 1.23 * 2.31 = 2.8413, then you calculate Round(2.8413 - 2.84) = 0.0013. While that may seem contrived (it was! ), the difference is significant in certain simulations and calculations. When doing math, computers have a very specific level of accuracy -- a certain number of digits of precision. If you want your simulations to come out right, you have to take these limits into account. Learning how to account for the computer's rounding errors is a bit of a black art. Mathematicians design algorithms in terms of matrix multiplications and dot products, and if you translate those algorithms directly into computer multiplications and additions, you tend to end up with a lot of cancellation errors like the example given above. You can hire a computer science grad student to rework your algorithm to not lose accuracy, but that is expensive and has to be done for every new algorithm. Or you can use an FMA for the dot products and the matrix multiplications (the high-accuracy dot product and matrix multiplication libraries already do this). FMA in software is slow. Single-precision emulated FMA isn't too bad since you can use double-precision to help with the hardest bits of the emulation. The result is that you can do one fmaf in about 4X the amount of time it would take to do a single a*b+c. However, SSE2 allows you to do 4 a*b+c at a time, so emulated single-precision FMA ends up being about 15X slower than optimized SSE2 non-fused multiply-add. Double-precision is harder, taking about 10 times longer than a single a*b+c, so it ends up being 20X slower than non-fused multiply-add. first of all, let me thank you for your wonderful analysis on Bulldozer architecture. I read it with great interest. However, I think that you left out a very important thing to mention: L1/L2 cache read/write bandwidth. Especially for L2, while latency is an important thing, throughput can be an even more crucial one. The key point is that Bulldozer has an write-through L1 cache, so all L1 writes are more or less immediately broadcasted to L2 cache. Some small writes can be effectively cached inside a write-back combining buffer called Write Combining Cache (WCC), but this cache is only 4KB in size per the entire module. So, streaming writes will immediatly fill the WCC and bring down L1 cache speed to L2 levels. 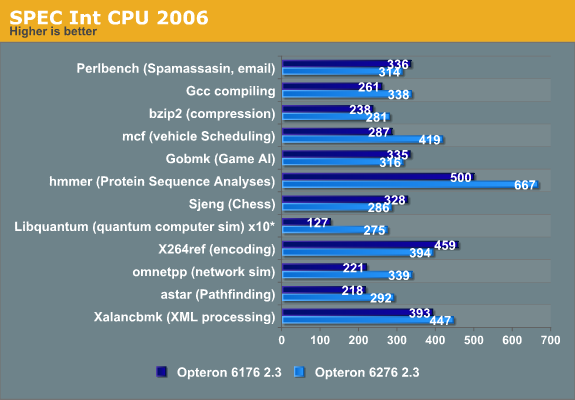 This can really hamper CPU performance. Obviously, AMD went this road for some understandable reasons, however, the WCC is really too small to cache much data and the L2 is way too slow to efficiently serve L1 write requests. This bring us to another point: L2 cache is slow. 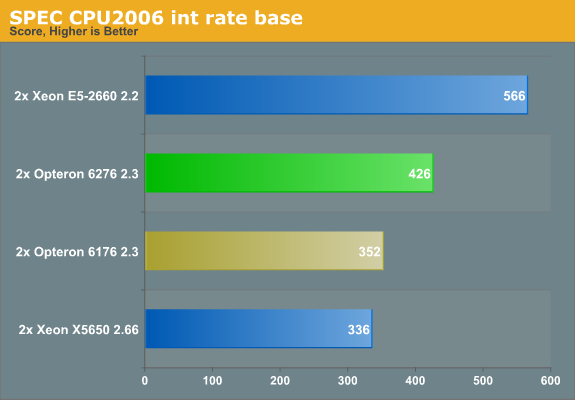 Comparing this with the super-fast (but much smaller) L2 Intel cache, it has no hope; it is more or less at Intel's L3 level. Note that, while I collected and normalized data from multiple web site, I left very clear what was the original reference (so that you can easily verify my data).